Among line-of-business executives, the enterprise accounting function has always carried a kind of mystique. Accountants come up with the numbers, then hand them off to the CFO, controllers, and the business and operations managers who require input for budgeting and planning. What accountants know—and sometimes business management does not—is that often there’s an important story hidden in the numbers. It might show how a tiny fraction of retail stores is underperforming precipitously, or how a particular manufacturing plant is suffering productivity losses because of raw material deliveries that are frequently late. Depending on company size or industry, there can be a dozen, or a hundred, or even thousands of details like these—hidden details that, if discovered in the right place at the right time, can tell a story that business managers want and need to see. With BlackLine’s Variance Analysis product, the accounting team can now collect, analyze, and communicate that story to management. And they can do so without having to add any new input to their ongoing account reconciliation process, since BlackLine‘s Variance Analysis works with the same information used for reconciliations. 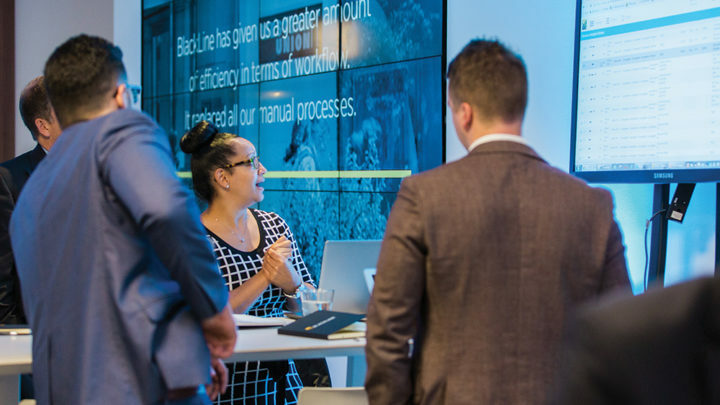 BlackLine offers an unlimited number of configurable rules, helping companies with complex F&A infrastructures, as well as automated workflows to help route variance explanations to management. Also, the BlackLine product can automatically calculate the individual account summary activities for a selected time period. “For instance, if I want to look at the month-over-month performance of an account, the software calculates the difference each month and stores the information in an activity file,” says Hunter. “The software will immediately populate the related dashboard whenever one of the accounts meets the materiality threshold that I set up in the rules. Hunter notes that the larger point, and the main benefit, of BlackLine’s Variance Analysis is its ability to help uncover the story that lies within the numbers. It’s also valuable that BlackLine’s Variance Analysis can be used as the numbers are coming in, as part of a Continuous Accounting model, rather than waiting for the end-of-month close. Hunter says that many companies still perform variance analysis the traditional way: after the month’s end. A better way is to take a Continuous Accounting approach and have variance analysis turned on all the time, working alongside account reconciliations. That way, accountants can see the analyses every day, identifying, explaining and/or correcting anomalies as they occur. Previous story Is It Possible to Achieve Fully Automated Bank Reconciliations?